As use of iPads and other mobile devices in the health sciences grows, there are an increasing number of subscription databases and journals making their content available. This portion of the AHSL Mobile Apps & Resources guide highlights some AHSL resources that have apps or digital versions available. Almost every resource is unique in how it makes its content available, whether it makes content available to institutional subscribers and/or individual subscribers, whether a personal login is required, and so forth. Some journals offer very basic PDF-like content while others offer more interactive content. If you have questions about whether a journal or database you use and that AHSL subscribes to has an app available and you do not see it listed here, please email us. Availability of such content changes quickly and we welcome your questions and comments. Mobile-friendly version of AccessMedicine. To use it, first go to the link provided here and create a MyAccessMedicine personal account. Once you have created that, you get access to their mobile interface, image saving, Diagnosaurus, and sample tests for the USMLEs. Mobile-friendly version of AccessPharmacy. To use it, first go to the link provided here and create a MyAccessPharmacy personal account. Once you have created that, you get access to their mobile interface, image saving, Care Plans, and Q & A.
Mobile-friendly version of AccessSurgery. To use it, first go to the link provided here and create a MyAccessSurgery personal account. Once you have created that, you get access to their mobile interface and image saving. More info available here: https://www.reaxys.com/info/reactionflash (copy and paste this link in your browser). Biological, ecological and environmental sciences journals. Institutional pairing of your device either via UAWiFi or manual pairing allows you access to The University of Arizona subscribed content. Customizable personal "library" app to view journals, follow personalizable Twitter feeds, and save articles. Full-text articles are available when you create a Docphin login with The University of Arizona institutional affiliation (also requires Docphin account). Tip: when it asks for your proxy login and password, enter your UA NetID and password. Displays customized healthcare-related content (journal articles, news, topics) in magazine-like format. To access AHSL articles, download the app (currently just for iPad), register for an account and choose the content you'd like to follow. Once you see an article you'd like to read, choose "Read entire article"; you can then indicate your institutional affiliation and, if AHSL licenses the content, you can authenticate and read full-text articles. Another option for selecting institutional access is to touch the gear button in the bottom right of the screen and select the institution from the Settings screen. AHSL PHOENIX ONLY - contact AHSL Phoenix (602-827-2062) for access instructions. Search CINAHL other EBSCOhost databases and journals (e.g., American Journal of Public Health, Cancers, and more) with this app for iPhone and Android. Open an EBSCOhost database on your computer and scroll to the bottom of the page. Click on the link: "EBSCOhost iPhone and Android Applications." In the pop-up, enter your email address to receive code and installation instructions. First Consult iPhone/iPad app. "Access point-of-care content even when no data connection exists" [via publisher]. Access Lippincott Williams & Wilkins journals and article abstracts with this app. Full text available for individual journal subscribers. App available for iOS and Android. To use the app with institutional affiliation, you must be affiliated (faculty, staff, student) with the UA and obtain a Natural Medicines Comprehensive Database CE ID#. To register, from a UA computer go to http://bit.ly/nat-med (copy/paste this link in your browser) and complete the form to obtain a CE ID#. Once you are issued the CE ID#, you may use it to access the app. From the National Library of Medicine, this app offers PICO and natural language search of Pub Med, with full text access to articles when you are accessing the app from an on-campus Wi-Fi location (note: can be slow, be patient). Provides a single place to discover new research, read outstanding topic reviews and search PubMed. For iOS and via web browser at https://www.readbyqxmd.com. Access to full-text once you create an account and set up institutional affiliation. Access SciVerse ScienceDirect via iPhone/iPad. Visit the full ScienceDirect site via http://ahsl.arizona.edu/databases, click on "Register" to sign up for your free account, then use this and your UA email to sign into the app. You will then be able to access ScienceDirect journals such as Journal of Allergy and Clinical Immunology, Annals of Emergency Medicine, Cancer Cell, Pain Management Nursing, Trends in Pharmacological Science, and many more. Read AHSL set-up instructions here: http://ahsl.arizona.edu/news/2012/statref-app-iphoneipad-android-blackberry (copy and paste this URL in your browser). If you are on UA WiFi, you should automatically be able to get full-text of AACR journals. For off-site access, you can download the app and apply for a mobile voucher, which will allow you (if you are an authorized AHSC/UA affiliate) to apply a voucher to your device that will enable you to access the full text of AACR journals through the app even when you are no longer connected to the subscribing network. This is not an app, but the Annual Reviews mobile site offers access to full-text articles from journals that have been licensed by AHSL (e.g., Annual Review of Immunology, Annual Review of Microbiology, Annual Review of Public Health, Annual Review of Pharmacology & Toxicology, etc.). Visit www.annualreviews.org from your mobile device while on an authenticated institutional wi-fi network. Your mobile device will be automatically paired with your institution’s access rights. The pairing will then enable you to access content while offsite; it lasts six months, and will be refreshed each time you access the Annual Reviews website while within your institution’s network. If you have a personal subscription, you can login with your Annual Reviews username and password to access subscribed full-text content. Free full article access for a limited time. After free access expires, Blood subscriber authentication will be required for full-text access. Full text access available via email authentication voucher. Make sure you are accessing the Internet through UAWiFi, download the app, then from within the app, go to Settings, Authorize This Device. ** Also see journal aggregator apps above such as Read by QxMD and Docphin. A selection of journals with apps available. 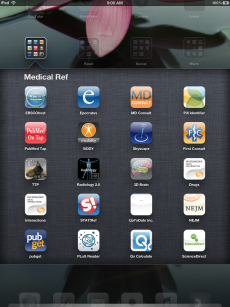 Also see iMedicalApps. Some free content (abstracts and selected full-text articles). More full-text options available for individual subscribers. Some content available free for a limited time. Some free content available for a limited time. Some free content (abstracts and selected full-text articles). More full-text options available for individual subscribers or by configuring app settings to work with institutional access. Current issue available. Other content requires individual subscription. Some free content for a limited time. Browse abstracts. Full text requires individual subscription. Includes Science, Science Translational Medicine and Science Signaling. Apps for iPhone and Android are available, but do not currently provide direct access to full text. All mobile sites and apps may not work on all mobile devices. PDF files and sites using Flash may not display on all mobile devices. Many databases also have mobile-friendly sites. These are not listed here, other than Annual Reviews. Some apps will only give you access to full-text if you are on campus using UAWiFi.